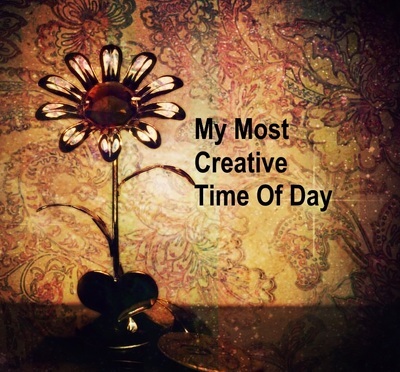 Okay, I admit the title could be misleading as my most creative time of day is actually night time. I am a night owl and always have been. Night time, is the time I am most creative and alert. That is, unless I have had a really busy or stressful day and am exhausted. Many people say the morning is the best time of the day. People who are 'morning larks' find they work best in the morning. I have read there is scientific evidence the mind is most creative early in the day but that doesn't work for me. I find I think more slowly in the morning and so it is better for me to write at night. I also do some writing during the day if I have time but do the majority at night. Another reason I like writing at night is that I find there are less distractions. The meals and housework are done for the day. I am less likely to get a phone call, although I do on occasions. It's just easier to settle down to a solid session of writing. Routine and habit may be contributory factors to my preference to write at night. I write most nights so my brain expects it to happen and gets into 'writing mode' then. When I was a student I found night was the best time for me to do research and write essays. However, I tried to avoid leaving it to the last minute to get assignments done as I dislike the pressure of knowing what I am working on is due the next day. Some people are different and feel they work better under that kind of pressure. Research suggests being a 'night owl' can have a genetic component. For some an individual's genetic make up, rather than habit, may be the major reason behind preferring to stay up late and rise later. Some night owls, but not all, have a mutation in the CRY1 gene. Night is a special time. In the middle of summer, night time often brings relief from the worst of the heat. I enjoy sitting out on the back verandah looking at the solar lights dotted through my garden. Some summer nights I hear an owl hooting which makes me happy. The owl has always been my favourite bird and I have a collection of owl ornaments. Is it a coincidence I am a night owl? After sitting outside enjoying the night I will feel inspired and go back inside and write. Although my most creative time is night, I enjoy daytime for doing many activities which would be difficult or impossible once the sun has set. I do like sunlight and in mid winter often wish there were more hours of light. However, when it comes to writing or doing other activities of a creative nature, my favourite time is the night.